More birthdays are looming on the horizon and I've come up with another coordinated gift set. A mug is always a welcome present - especially if it's a hug of a mug like this popular design by the incredible Emma Bridgewater. And if the mug is nestling in a bed of tissue paper in a made-to-measure, coordinating gift bag and accompanied by a matching card, it makes the present rather special. Adding hot chocolate, marshmallows etc piles on the Yum factor! Here's the set I came up with to coordinate with the mug. First measure your mug, adding half an inch each side it so it has room in the bag. My mug was 6" wide and 4 1/2" deep including the extra room. So the width of my paper needed to be 2 x 6" (front and back of the bag) plus 2 x 4 1/2" (sides of the bag) plus 1/2" for the flap = 21 1/2". My mug was 6" tall and 4 1/2" deep including the extra room, so the height of my paper needed to be 6" + 4 1/2"(for the base of the bag) = 10 1/2". Hope that makes sense. So we start with a piece of paper 21 and 1/2" wide and 10 and 1/2" high. Score and fold it at 4 1/2", 10 1/2", 15" and 21". Now it looks like this. Next measure 4 1/2" up from the bottom of the paper and score and fold it horizontally like this. Snip the vertical lines up to the horizontal line. Cut the bottom of the 1/2" flap of completely. Scallop the top edge of the paper if you like to make a pretty trim on the top of your bag. Okay. Time to do some stamping. I chose to decorate only the two 6" panels which will be the front and back of the bag. 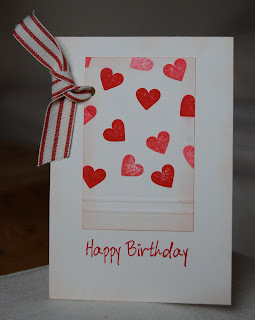 Use a pencil to make a mark at 2" and 4" about an inch below the scalloped edge on the decorated panels. Use these as a guide to set the eyelets with a cropadile. Fix double sided tape to the 1/2" inch flap next to one of the decorated panels. Now turn the project over and fix double sided tape to the bottom flap below the left-hand eyelet panel. Now start to assemble the bag. The key to this, I've found, is to do it slowly and gradually, making sure you line up the edges. The two flaps either side of the taped flap need to come in now. I take one piece of tape off at a time and carefully line up the edges before fixing. Now the bag should look like this. Fix double sided tape on the last flap - I've just begun to do that here. This flap is going to be the very bottom of the bag so try to make it neat! Here we go! Finish off that flap with another piece of double sided tape and fix it neatly into place. Now peel off the backing of the tape you fixed to the 1/2" flap and stick it carefully to the loose edge to complete your bag shape. Thread ribbon through the eyelets and secure with knots to make handles for your gift bag. 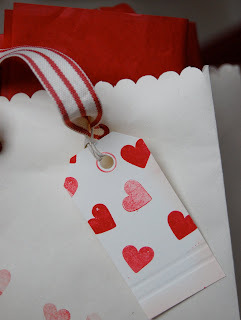 Make a pretty tag using Very Vanilla card stock, dry-embossed with lines and decorated with hearts. Sponge the edges with Blush Blossom ink. Hope you've enjoyed it as much as I have. If you feel inspired to make a coordinating gift set using a piece of inspirational china (or anything else for that matter) I would love to see your projects so please leave me a link! Oh I love this project and I am keeping it in mind for this year teacher's presents at the end of school year!! Thanks the tutorial it's great!